Great Yarmouth Green Gym is an independent nature conservation group run entirely by volunteers. We meet twice a week and the sessions are free and open to anyone aged 18 and over. No prior experience or skills are necessary. A range of tasks are available to suit all abilities and you can work at your own pace and everyone is encouraged to do as much or as little as they like. You do not have to be physically fit to join us. Our aim – By taking part in outdoor practical nature conservation activities you can increase your fitness and energy levels and help improve your health and wellbeing. You can meet new people, learn new skills and help make a positive contribution to your local area. When we meet – at 1pm every Tuesday and Thursday throughout the year. The sessions last for 3 hours, but you can just do an hour or so if you prefer. You don’t have to book in advance – you can just turn up at the meeting point on any of the Task days. There is no commitment to attend every session, you can just attend whichever sessions suit you. We have a chat and a laugh while we work and there’s a tea-break half way through (tea/coffee provided). What you need – old outdoor working clothes suitable for the weather and reasonably sturdy shoes or boots if you have them. We provide all the necessary tools and personal protective equipment including gloves. Where we work – on Tuesdays we work at a variety of local sites on the coast and inland, on The Broads and marshes as well as more urban areas. On Thursdays the group works at Beacon Park woodlands in Gorleston. This is a huge ongoing project to turn a neglected belt of trees into an asset for the local community to enjoy. 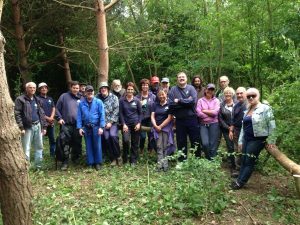 What we do – Tasks include thinning and coppicing trees to encourage understorey shrubs and wildflowers, cutting back scrub, making dead hedges, making pathways, building benches and working to improve the habitat for wildlife. Interested? – Have a look at our current Task Programme (click on the Programme tab at the top of this page) to see where and when you can join us or contact me using the details given below or use the Contact Us link at the top of this page.